This statistic shows the growing internet usage in the United States from 2000 to 2016. In the most recently reported period, almost 287 million internet users accessed the web from the United States, up from 283.71 million in the previous year. In the modern world, the internet seems to dominate our daily routines, whether it used to check the news, schedule a meeting, revise for a class or order the weekly shopping. 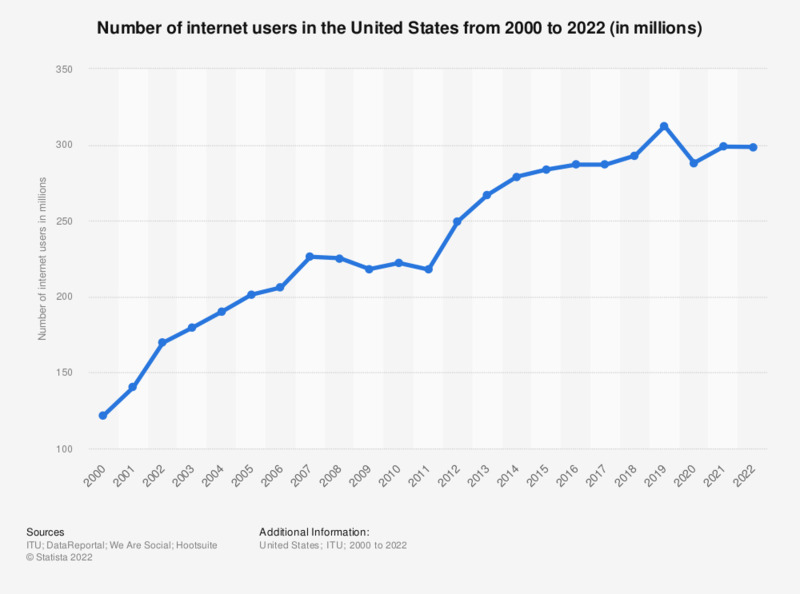 As a result, the number of internet users is growing and subsequently so is the amount of time users are spending online. The weekly time spent by internet users in the U.S. accessing the internet via a computer during the second quarter of 2014, was measured by age group. The results revealed that the age group who spent the most time on the internet on their computer were those aged between 35 and 49 who spent an average of 466 minutes per week online. Even those aged between two and eleven were logging on, with their average weekly internet usage amounting to 23 minutes. Examining the distribution of internet users from both home and work locations in North America as of June 2014, by age group reveals some interesting statistics. Internet users aged between 15 and 24 accounted for 19.8 percent of the region’s users. It was the group aged 55 and over who held the largest share however, of more than a quarter of all internet users, with 26.7 percent. The U.S. is ethnically diverse and an analysis the country’s internet users by ethnicity reveals how many of each ethnic group are online. In January 2014, it was discovered that 85 percent of white Americans were internet users. In comparison, 83 percent of Hispanics were internet users, and the share of African-Americans was slightly lower at 81 percent.